July and August were tough sampling months due to weather conditions, but we did it! 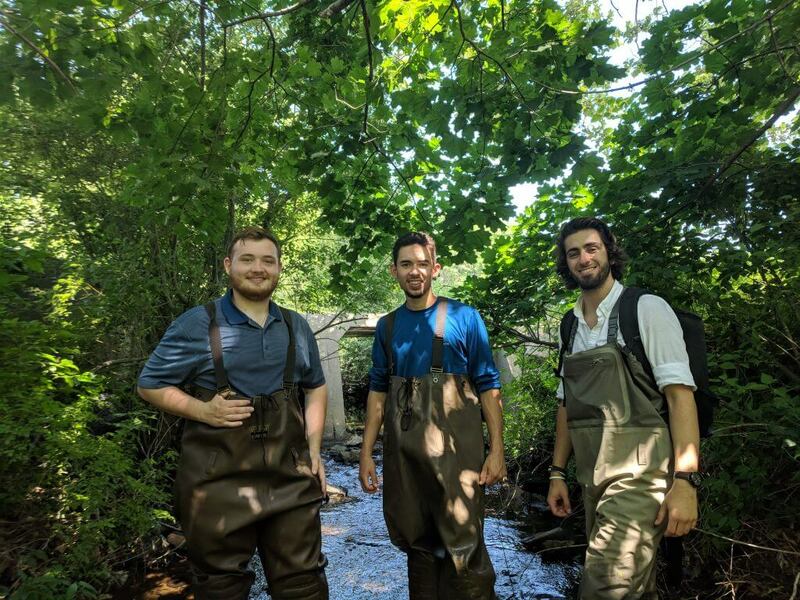 Thanks, as always, to all of the dedicated volunteers who sacrifice their mornings to help us take water samples all over the Neponset. 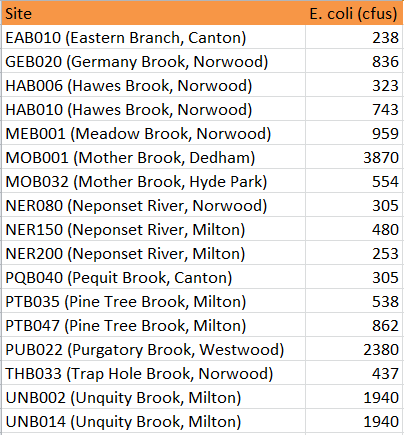 The results have come back from the MWRA lab, and the E. coli levels were higher than normal. In July, there were 17 of the 41 sites that had E. coli levels that are considered too high to be safe for swimming (anything over 235 cfus). 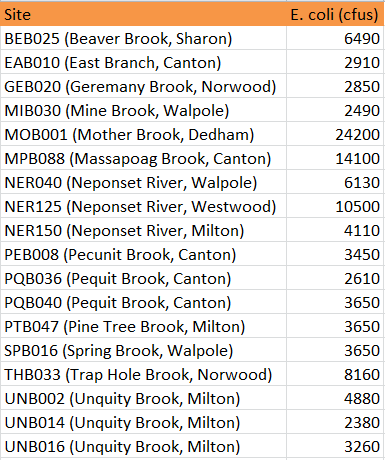 Of these 17 sites, 9 had levels low enough that made them considered safe for boating (anything under 630 cfus). Map visualization of the E. coli data from the CWMN sites. 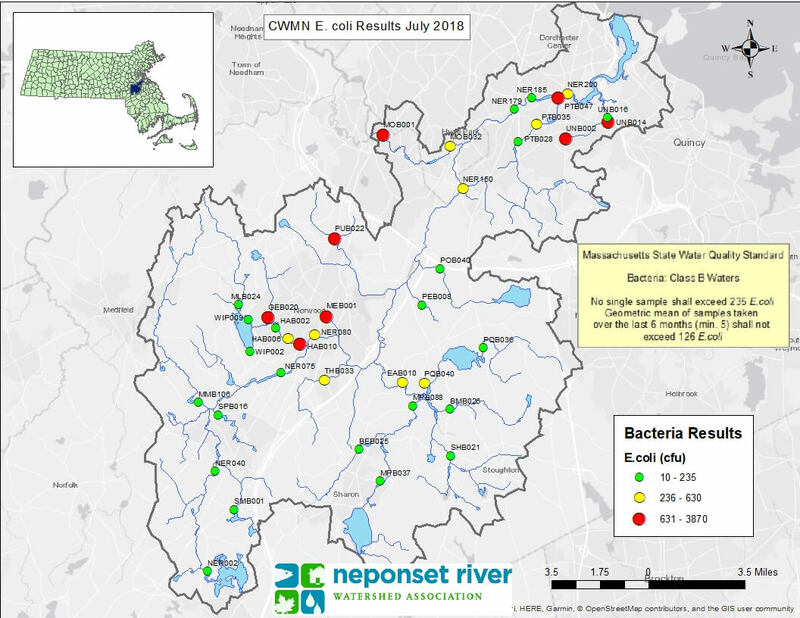 Red sites have E. coli levels that exceed what’s considered safe for swimming, yellow sites have E. coli levels that exceed standards for boating but not swimming, and green sites are safe for both activities. 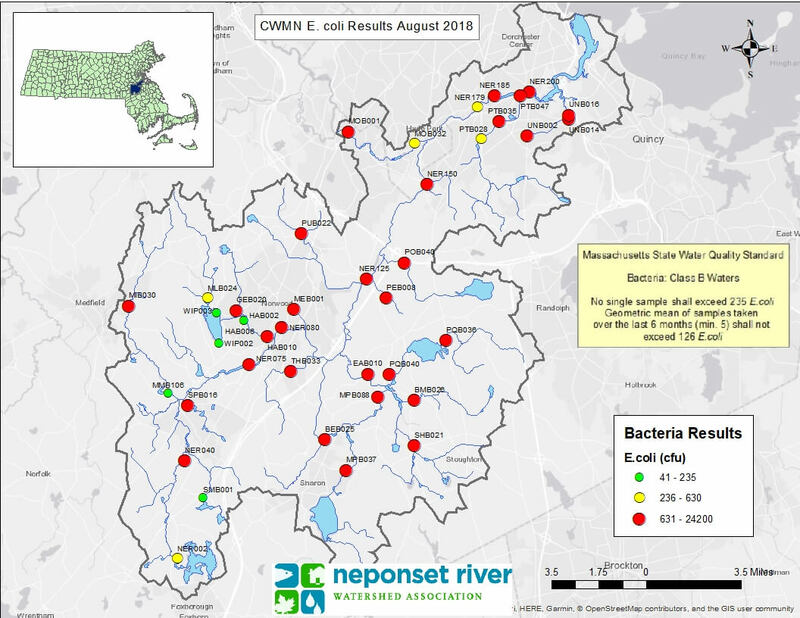 The 18 CWMN sites with the highest E. coli in July 2018. In August, the E. coli results were off of the charts. 37 of the 41 sites had E. coli levels that are considered too high to be safe for swimming. Out of 37 sites, only 3 had levels low enough to be considered safe for boating, while 18 sites had levels that were 10 times the amount that is considered safe to swim in! The 18 CWMN sites with E.coli levels over 10 times the amount considered safe to swim in, August 2018. The main cause of these high E. coli concentrations is the amount of rain we had during the days leading up to the sampling. Most of the sites listed above are safe for swimming when the weather is dry. However, when it rains, all of the pet waste, trash, gasoline, and other pollutants on the street get washed into the storm drains, which empty into the river. This is why it is extremely important to clean up after ourselves and our pets because everything we leave on the streets, sidewalks, lawns, and trails has a good chance of ending up in the river. If we all do our part we can prevent stormwater pollution from taking such a heavy toll on our waterways. Click here for things you can do around your home to prevent stormwater pollution. Andres, Charlie, and Mike testing a hotspot in Purgatory Brook.